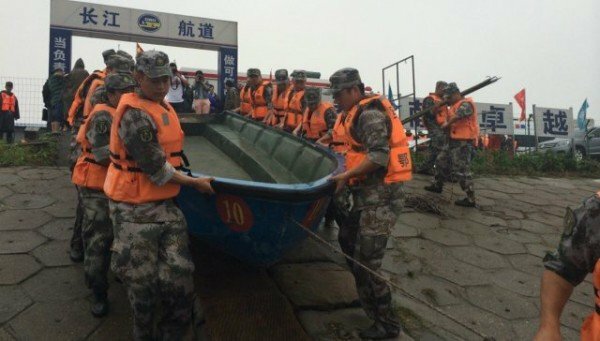 At least 5 people have died and hundreds are missing in China after a cruise ship carrying 458 people capsized on the Yangtze River. According to officials, 14 people have been rescued, with some found alive inside the upside-down hull of the vessel. Three of them were rescued from inside the upside-down hull of the ship after it was cut open, Xinhua reports. The boat, the Eastern Star, reportedly sent no emergency signal. The alarm was raised by those who had swum to shore. The captain and the chief engineer, who both survived, have been detained. They say the boat was caught in a cyclone. Chinese media quoted them as saying the vessel sank within minutes, while many people were asleep. Most of those on board were tourists aged around 50 to 80 travelling from the eastern city of Nanjing to Chongqing in the south-west – a journey of at least 930 miles. The ship sank in the Damazhou waterway section of the Yangtze, where the world’s third longest river reaches depths of about 50ft. Strong winds and heavy rain have been hampering the rescue efforts. According to the People’s Daily, three bodies were recovered in Yueyang, Hunan province, some 30 miles away from the site of the sinking. Footage aired on state TV showed divers knocking on the submerged hull with hammers to try to make contact with people believed to be trapped below. Chinese PM Li Keqiang has arrived at the scene, according to the People’s Daily. Eastern Star – Dongfangzhixing in Chinese – had been carrying 406 Chinese passengers, five travel agency employees and 47 crew members. The boat sank at about 21:30 local time on June 1, but rescuers did not reach the vessel until at least two and a half hours later.